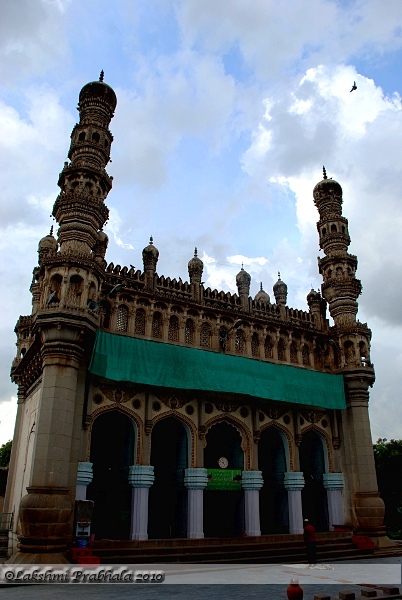 This ornate mosque, situated in the suburb of Karvan about 2 km from the Golconda fort, was built in 1671 by Mir Musa Khan Mahaldar, royal architect of Abdullah Qutb Shah. The facade has five arches, each with lotus medallions in the spandrels. The central arch is slightly wider and more ornate. The upper half of this mosque is the most ornate of the period. The parapet is composed of a series of arched jali screens, each of a different pattern. Above this runs a row of crenellations punctuated by six finials. The elaborately decorated minarets have three receding tiers of octagonal galleries, the central one raised on a series of deeply recessed, carved mouldings and petals. The minaret shaft is covered with curvilinear patterns. The composition is surmounted by a near-spherical dome and a brass finial. Previous Post to all brothers and sisters!